Shreveport Opera will open its season with Cavalleria Rusticana and Pagliacci, says Sumer Cooner. The two one-act operas will be presented Saturday, November 8th at the Riverview Theater in downtown Shreveport. A free preview will begin at 6:30pm and the curtain will rise at 7:30. 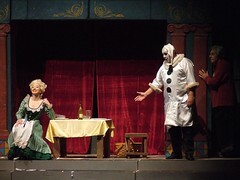 Cavalleria Rusticana and Pagliacci are both love stories that end with betrayal and tragedy. Tickets range from $10 to $85. For tickets and a full synopsis, visit www.shreveportopera.org or call (318) 227-9503. If you would like to make a tax deductible donation to Shreveport Opera, a non-profit 501(c)3, please visit www.shreveportopera.org. Hard-working cut & glue types and good looking poseurs are needed for Xmas in the Sky work, says Bonne Summers. 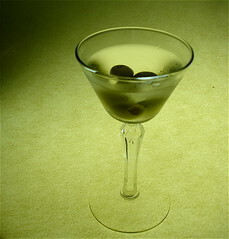 The gargantuan 08 benefit - Sat, Dec 13, 7 pm to 2 am - is called Shaken, Not Stirred. - people who can cut, glue, sew and strew glitter; they will assist the costume director. - James Bond-type fellow able to pose bare-chested in a hot tub scene alongside 2 Russian beauties. 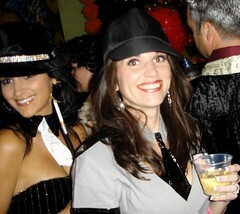 - glam girls to be suited in tuxedo jacket dresses. Talk to Mrs Summers at 673-6510 or email bonne@shrevearts.org. 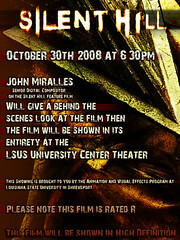 The Animation and Visual Effects Program at LSUS will offer a screening of “Silent Hill” in High Def on Thurs, Oct 30, at 6:30 p.m. in the LSUS University Center Theater, says John Miralles. Miralles, director of the Animation and Visual Effects Program, will give a brief behind the scenes look at the film before showing the film in its entirety. Miralles will talk about his experience being a Senior Digital Compositor on the Silent Hill film, which he said is based on a video game and from the horror genre. 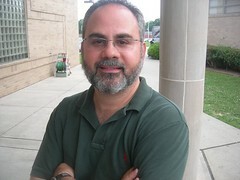 Miralles, who arrived in Shreveport in July, has an MFA in advanced computer graphics from the School of Visual Arts, NYC. He also has a list of movie credits at his IMDB page. The screening is free and open to the public. Please note this film is rated R.
Yet A&VE needs to reach the young. To do that Miralles has an Animation and Visual Effects workshop to whet the appetite of teens 15 and up on Sat, Nov 22. There will be a Jan workshop for the under-15's, he says. in concert on Nov 8 at 7:00 pm in the Shell amphitheatre. In a response to a call by the community to support "Under 21" bands, Centenary College and Ren Ten Music, LLC is sponsoring this concert for all ages. Mark Charleville, "Crossing Blood Bayou"
Artist Mark Charleville of Benton, La, has been invited to participate in a group showing at Steve Martin Gallery of New Orleans during the the Prospect 1 project. 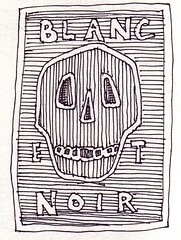 His work will also be hanging at the Julia Street Arts District gallery during the coming New Orleans Art Walk. Charleville is a multimedia artist. His present work is in acrylic, oil, pencil and inks on wood panels and canvas. He also works with digital images. 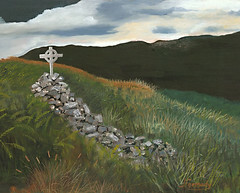 Mark's work has been shown in galleries and museums throughout the United States and is in many private collections. minicine? hosts The 7th Annual Gadabout Traveling Film Festival at 7PM at Lee Hardware Gallery, says David Nelson. Those prepared for undead fun will get their media exposure and donate their money or non-perishable food to the Food Bank of NW La at Mall St Vincent on Sun, says Killer Queen. 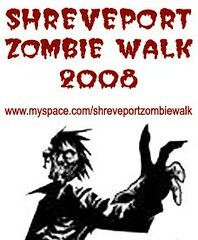 The Shreveport Zombie Walk, part of a global monster walk, is a benefit for the malnourished. More instructions: "We will actually "walk" at 5:30, but please be there to register starting at 3 pm. Costume judging will be going on between 3 and 4:30, with the judges walking the crowd. You really don't want to miss the live, full costumed Thriller dance that will happen at 4:30!" More: "This is an all-ages walk and a family event. If you are under 18, please try to bring a parent/guardian with you - or at least make sure that your parents know where you are and what you're doing. We ask that you not drink before the walk, due to drunk-in-public laws. Also, please follow all regular laws of the City of Shreveport and State of Louisiana. We ask this for your safety and the safety of others. We will be unable to help with makeup.Show up in costume and makeup. Please do not bring extra blood or supplies with you. If you make a mess, you are legally responsible for it." The Northeast Louisiana Celtic Festival will fiddle and jig on Saturday & Sunday, Oct 24 & 25 at the Hamilton Expo Pavilion in West Monroe, LA. Host Doyle Jeter calls it "Two full days of some of the best in live Celtic Music to be found anywhere!" Quite a lovely web site: www.nelacelticfest.net. 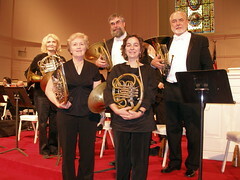 Representatives of the Shreveport Symphony, the American Federation of Musicians, and the Mediator from Federal Mediation and Conciliation Services met for four hours on Saturday, October 18, 2008 in Shreveport to discuss issues. While the parties did not reach an agreement, the discussions were candid and productive. The parties have agreed to schedule another meeting within the next two weeks. It was also agreed that the concert of November 22, 2008 will remain scheduled with the parties striving to reach an agreement in anticipation of the concert proceeding as scheduled. The Symphony and the Union also mutually agreed to retain a third party advisor with experience in symphony management to review and provide recommendations, in an effort to resolve issues. The parties will refrain from legal action while these discussions are underway and there will be a press black-out, except for joint press releases, subject to twenty-four hours notice. Representatives of the Symphony and Musicians are committed to continuing their joint efforts to resolve issues and reach an agreement for the benefit of the community, supporters and the players. The Musicians and Symphony will keep the community apprised of progress and future developments through joint press releases. Fairfield Studios, 1510 Fairfield Avenue. A message from JimHuck, the bassist for the duo drolly called the Recliners: "Get your fresh veggies and hear some homegrown Recliners' bluegrass, ole time & countryesque music this Saturday, 9-noon at the Farmers Market, Festival Plaza downtown. Weather should be nice!" 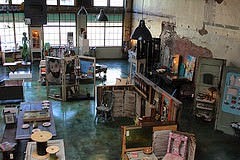 The downtown arts tour - called TNT for its third Thurs incarnation - is calling you. 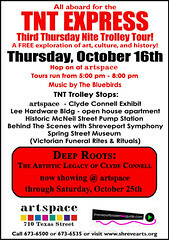 Ride a trolley and enjoy a historic and artful evening. Hop on at Artspace between 5 pm and 8 pm. 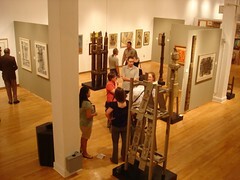 "Actual Works to be juried will be accepted beginning Tues, Oct 14, 2008. Works are due no later than 6:00 pm, Tues, Oct 21, 2008." So says SRAC guidelines for artists submitting to the jury for a place in the exhibit and sales gallery called Deck the Halls 08. Sample the Salsa at the Actor's Cafe on Wednesdays, says proprietor Jeff Nightbyrd. Benefitting Artspace and chaired by Elizabeth and William Joyce, says Stacie Leng, the annual dance and costume party called Artscare spills over Texas St on Fri, Oct 24, 8 pm until. The dark evening is hosted by Donna Poimboeuf, emceed by Chrissi Coile and features games, boutique, disco, karaoke, buffet and cash bar. Buy tickets online at Shrevearts.org. The tariff is $50 per. at 7pm, says Sumer Cooner. See it at Barnes & Noble, 6646 Youree Drive. Admission is free for what the opera calls a timeless classic with a musical twist. If you make a purchase with a Shreveport Opera Voucher the day of the show, a portion of the sale will be donated to the opera, says Cooner. The West Edge Artists' Co-op monthly series called An Evening of Art brings designer-painter Chris Opp to the projector and podium. He will speak about his life and work - which has been produced from California to New Mexico to Shreveport-Bossier - at the Bossier Arts Council on Fri, Oct 17, says Neecee Blackwell. The Evening has refreshments at 5:30, the talk at 6:30 and the exit at 7:30. 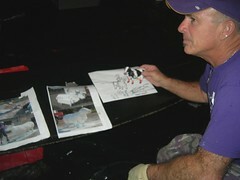 The photo above shows him developing designs for SRAC's bi-annual Xmas in the Sky. Michael Susano will be playing solo jazz / blues guitar @ the Noble Savage on Texas St, Wed, Oct 8. Susano wrote, "Sorry for the short notice; wasn't sure I could make it due to tendonitis, but, I'll be there." How to get to the Savage? Susano: "Across from the library, just down from the courthouse heading east." 2 sets, 8 & 10 pm. Port Belly Project, one of the city's most active belly dance troupes, is alive and undulating, says Kathy Fontaine, aka Kahina. 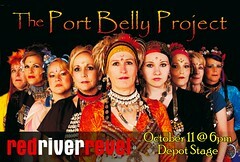 "Look for us at this year's Revel on Sat, Oct 11 at 6 pm on the Depot Stage. 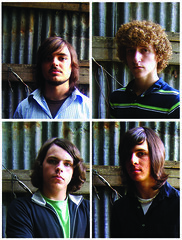 Many thanks to our photographer, Frank Copeland, for the professional polish on our latest promo pix. Not only have we been performing many more places this year presenting our wide array of belly dance styles, we've even performed a can-can and bollywood dance! Other exciting news.... we're expanding into the bigger, beautimous space next door : 444 & 446 Olive St.! Nicole Brice will be joining us to offer yoga classes, along with Pam Viviano and Karin O'Bannon. Lots of bellydance, of course and Jeremy Haas will be offering Okinawan Shorin Ryu Karate classes on Sun afternoons and Tues evenings. 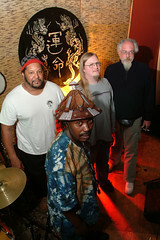 Folks can check out the schedule on our website: www.lotusstudio444.com." Teachers can take groups of students to enjoy art activities designed to accompany the Clyde Connell exhibit at Artspace, says Tarama Davenport. 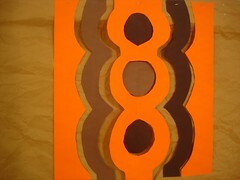 Collage, assemblage and painting in imitation of Connell's work were included in artivities designed by Tarama and Jerry Davenport with Robert Trudeau. Older students may want to simply sit on the floor of Artspace and write about and sketch the Connell sculptures and paintings. The exhibit will be on view through Sat, Oct 25. Let's make a date, current members and those yet to pay their dues: Sun, Feb 22, '09. That's 2 days before Fat Tuesday, Mardi Gras. We of the Blanc et Noir Marching Society will don old clothes and face paint, gather all our money to pay the band, and stroll through Highland in one of the loveliest gatherings on earth: the Krewe of Highland parade, Shreveport. Mail checks to Robert Trudeau, s'il vous plait. That's 912 Monrovia St, Shreveport, LA 71106. With a background in fabric as well as painting, and training in the fertile grounds of Chicago and Philadelphia, (School of the Art Institute of Chicago, Chicago, M.F.A., 1983; Philadelphia College of Art, Philadelphia, B.F.A. 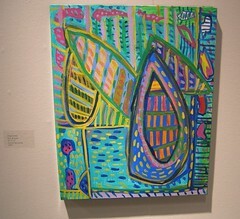 with Honors, 1981), painter Ellen Soffer is one of the most grounded as well as most developed artists in the region. If you want to talk art, art criticism, art history, the business of art, enjoy chatting with Ellen at Karpeles today as she opens a new exhibit. 1 to 3 pm reception at Karpeles Museum. 6:30 p.m.: Afrissippi (African beat). 8:30 p.m.: The Blue Runners (Louisiana roots). 1 p.m.: Papillion (street performer). Noon: Stilt dancing workshop with Shaka Zulu. 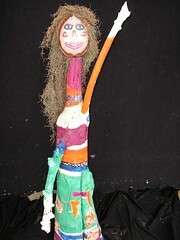 3 p.m.: Stilt dancing workshop with Shaka Zulu. 6 p.m.: Stilt dancing workshop with Shaka Zulu. While the opening of the Clyde Connell show was crowded - some 400 people attended the opening night party - the scene at Artspace is serene during viewing hours. Some 100 pieces of work by Connell are on display. Upstairs is work by Connell's descendents: Bryan Connell, Bryan Colvin, Dixon Ent, Dr Pat Sewell, Dr Bennett Sewell and Talbot Hopkins. Artspace hours are 10 a.m. to 6 p.m. Tuesday through Saturday at 710 Texas St.
Shreveport's orchestra musicians, worn out by a protracted battle with the Shreveport Symphony board, mutely went into strike mode on Thursday, says the Shreveport Times. Meanwhile, an alternative symphony is being birthed by the musicians. On Sun, Oct 11, the Opus (Orchestra Players United of Shreveport-Bossier) organization will present a full orchestra concert at First Baptist Church. The performance has been billed as a benefit for hurricane relief in NW La. The board's attitude seems to be "The money simply isn't there." The musicians' attitude seems to be "You have not effectively searched for the money." Nor has anyone stepped forward to offer the funds or a viable plan to generate orchestra-saving support. Shreveport's ability to survive and be productive can be measured by the way we approach this phase of the struggle. Instead of antagonistic press releases and a replay of the vituperative remarks anonymously posted on web sites, I propose a change. A public presentation - online or on TV or radio - of each side's position, followed by mediators' analyses, would be a helpful next step. It would be a bit like a presidential debate. One of the mediators' roles would be to tell the audience what has happened to orchestras in similar circumstances. At the end of the presentations, however, must come a pitch for money. Is there any effective way to rebuild the fund that will support a Shreveport-Bossier orchestra? When the Devil Music Ensemble last toured through Shreveport they were accompanying the silent vampire flick Nosferatu. This time their performance will accompany an early Chinese martial arts movie. The Devils are tight. Each musician plays several instruments and the effect is at times akin to a small orchestra. As needed they rock, they waft, they suspend, they explode. If you are a musical type, I recommend sitting close to the players. To watch them change instruments is a pleasure. This is a serious touring group: 40 cities in the US and across Europe in the summer. Their fee is being footed by Centenary College. 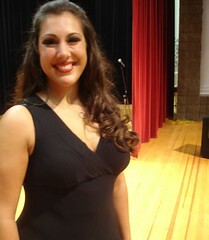 Michelle Glaros: mglaros@centenary.edu or 869-5264.